Pin it to your CANDY recipe board to SAVE it! See’s Candy has the absolute best chocolate! So good that Santa always made sure to fill my stocking with a box of my favorites (and of course mom’s Homemade Christmas Caramels). I am usually a fan of the candies that have milk chocolate and caramel (love the Patties and Pecan Buds) but over the recent years I have branched out and started trying new things chocolates like Polar Bear Paws. These Polar Bear Paws have creeped into my Christmas box as one of my new favorites. 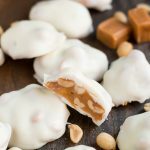 The sweet and salty combo of the peanuts paired with the soft caramel and white chocolate (these white melting wafers work great for candy making) is a dream come true! 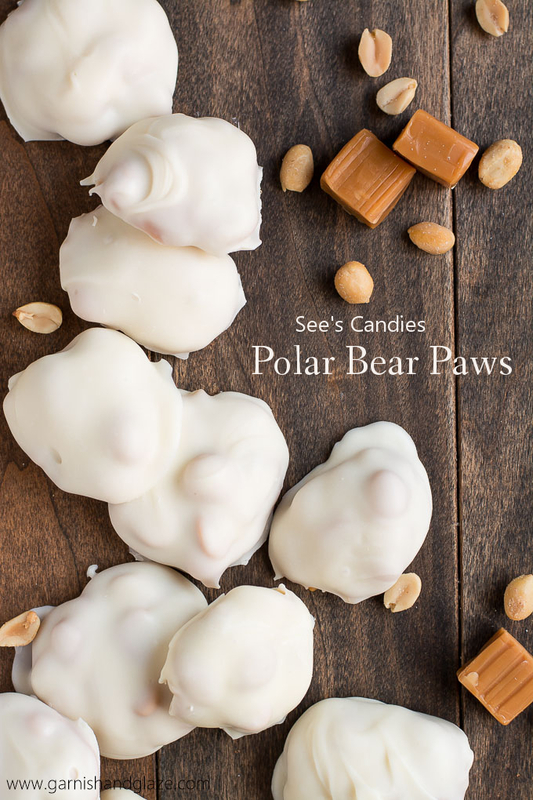 See’s gourmet chocolates are pricey ($23/pound for these Polar Bear Paws) so if you aren’t rollin in the dough or if you just don’t have a store in your area, you can just make them at home and for a lot less. Polar Bear Paws are quite simple to make. 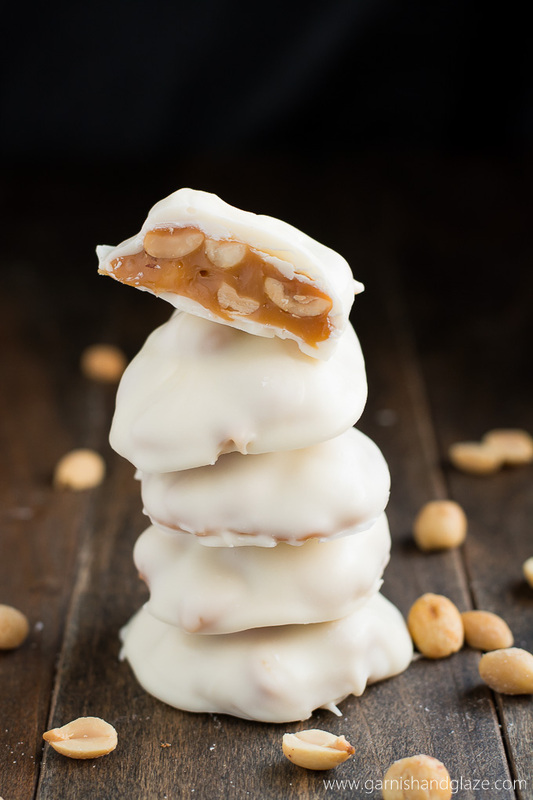 You just mix some peanuts with melted caramel, spoon it onto a parchment paper lined baking sheet , refridgerate to let it set, and then dip it in white chocolate. These do taste best made with homemade caramel, but if you don’t have the time what you find at the store works too! 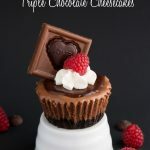 What is your favorite kind of chocolate/truffle? Is there a type of candy that you get in your stocking each year? White Melting Wafer– This is my favorite chocolate for candy making. It melts well and easily and tastes so good. Small Cookie Scoop– I love using this little cookie scoop for making candy. It helps create the perfect bite size treats that are all uniform in size. Put the pan back in the fridge for 30-60 mintues until chocolate is set. Remove and package up. *If making this with homemade soft caramels then do NOT add the butter and whipping cream. **If using my caramel recipe, you'll only use half of the recipe for the Polar Bear Paws. Spread the holiday cheer with more Christmas treats! These look amazing! Derek is a caramel junkie and would totally be obsessed! Very tasty, next time I will put them in the freezer, or just take a few out of the fridge at a time when dipping. The caramel warmed to room temperature pretty quick and they got real sticky/gooey while dipping. Mmmm! Milk chocolate sounds awesome in these Marie! I made these last night, made the recipe as instructed, set in the refrigerator for hours. When I went to take them off the parchment paper they were so sticky I had to use a knife to pry them off. Dipped them in white chocolate. I thought these are so sticky to work with, they do not release from the parchment paper at all. I did use kraft caramels from the store. Well, after the taste test, THEY ARE SO WORTH THE TROUBLE, ABSOLUTELY AWESOME!!! I will have to make the homemade caramels next time to use!! I make homemade turtles and learned waxed paper works much better. I still use a frosting knife to scrape up. Next time put the caramels on a silpat. That will work much better. 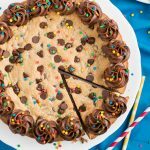 Could I use white chocolate chips in place of the Almond bark? 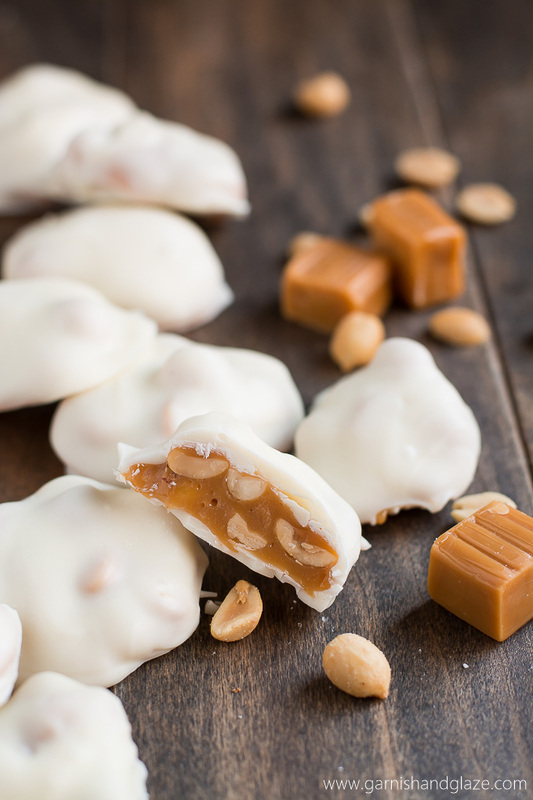 What store bought caramels would you recommend?? would those LG caramel bars that Come in the red box with the green and gold striping possible work? – tho I have not seen them in stores For a while now! Also can I use different types of nuts or will they not work as well?? I’m trying to give my kids a different perspective on Christmas this year. We are going to be doing alot of baking and crafts ect. 90% of all gifts this year will be made by the giver and the other 10% are to be purchased handmade. Our goal is to not involve big retailers in our christmas cheer this year. I can remember when I was growing up and we were happy with getting what we got non of this $100 minimum per purchased gift or tantrums cause we didn’t get an IPhone or IPAD or the latest game and gaming system…… So any ideas for unique and tasty treats that you can share – which are not to difficult to create or ideas for how to package the yummy treats festively including what combinations of goodies to put together would be openly appreciated & extremely helpful!! I wish everyone a very merry Christmas season and a much better new year to come!! You can but I feel like white chocolate chips are a little more difficult to work with but that could just be the brand I used. It tended to thicken quickly while I was working. I used the Kraft brand caramels. I haven’t tried the LB bars. Do you think using pecan pieces would work just as well. I’m not crazy for peanuts. Yeah! I recommend roasting them first for better flavor/texture. Just put them on a cookie sheet and bake for 7 minutes at 350 degrees F. Enjoy! I can’t find vanilla almond bark…any other suggestions on what else could be used, or where to buy it? I’m in Canada. Julie, It’s in the baking aisle next to the chocolate chips. It should be by the chocolate bark or candy coating. It might just be called Vanilla Candy Coating. It’s sold in a big brick (like 2 pounds). If you still can’t find that you can use white chocolate chips. In the body of the post you linked to white chocolate but in the recipe you call for almond bark. Quick one is preferred? Thanks! Bryn, You can use what is linked (white chocolate melting wafers) or almond bark (which is white chocolate made for candy coating). Melting white chocolate chips didn’t work well for me. It was too thick to work with. You should be able to find the white chocolate melting wafers in your local grocery store or super market. So White Vanilla Almond Bark is actually white chocolate? It’s not technically based on the % of certain ingredients but it tastes just about the same. Ghirardelli’s “melting wafers” are also not technically called chocolate either. I think it’s due to a higher fat content but that is what helps the wafers and bark be easy to work with to make candy because you don’t have to temper it. I would not dare make this. I would hide and eat every bit myself. Better to just pass on this one, but I sure would love to have a tiny corner of just one. I did give it a rating because I am drooling on my keyboard. haha! I love the review Marilyn! Yeah, if you really want to test your self-control these are the treats to make! Make them, eat a small one, and give the rest away! 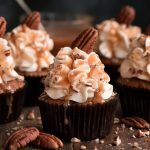 Hi Melanie – thanks for the fun recipe! And, at what point (temperature would work) do I need to put the nuts in when making the caramel from scratch? Please let me know! I was wondering the same… I ended up making the homemade caramel and adding about a cup and a half of peanuts, because that was all I had… If I’d had more I would’ve used two cups. It made quite a few – probably close to 80 clusters. Sorry to just see this MaryAnn! 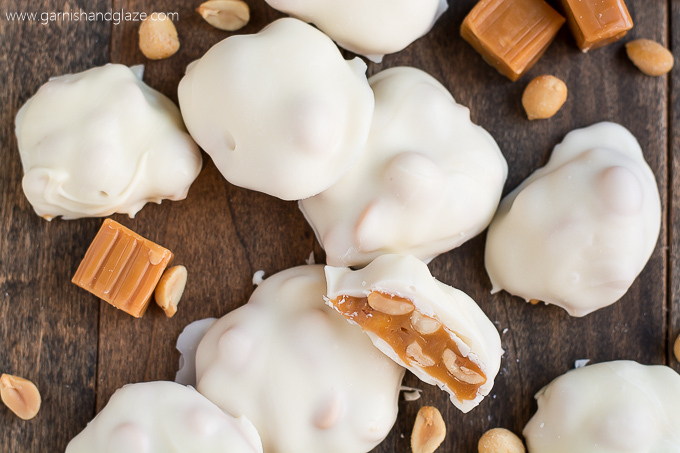 You’ll just want to use half the caramel for making these Polar Bear Paws. I have the same question as Amy. Although, I plan to make your caramel recipe and keep what I don’t use for this recipe. About how many home made caramels should I use for this recipe. Susan, Sorry to just see this! Use about half (or less) of my caramel recipe for making the Polar Bear Paws. Do you store these on the counter or in the fridge? Thank you! Just got done with your caramel recipe, it smells amazing! Do I need to let it cool before I continue with the rest of this recipe? I’m going to try your caramels recipe next. Do you remember where you bought those little snowflake white tin buckets? Thinking Target or craft store would have something like that. That is so awesome to hear! I’m happy they were such a success! I have been loving the Ghiradelli melting wafers too. My favorite chocolate to work with for dipping. I got those tin buckets at Target in their dollar section. They usually always carry them for each season/holiday. I have bought way too many. Why would you use almond bark in the polar bear paws? I would not use them but white or vanilla wafers. The chocolate coating would be lumpy and dumpy with the almonds from the bark. Hey Susan, Almond bark is candy coating that comes in a huge block that you chop up. It doesn’t actually have almonds in it. I’m not even sure why they call it that. You can definitely use white chocolate melting wafers (ghirardelli makes really good ones). Can these be frozen? I wanted to freeze them for about 5 days before I hand them out. 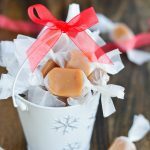 I found these easy enough to make but I was making a quadrupled batch for holiday gift bags and it took 5 hours so in that regard it was NOT easy. I also had trouble with the chocolate sweating afterwards and right now I have a fan on them trying to decide if they will hold up in a treat bag without melting. Our weather is neither hot nor wet/humid so ???. I followed the directions to a T, even buying the recommended white Giradelli wafers and using Kraft caramel squares. I will not make them again as a gift. These are good, but even using a tablespoon scoop to ensure they were all the same size, I only got 16, not 24 as the recipe says. Melanie, I didn’t use a measuring tablespoon to measure exactly. I do use a small cookie scoop (as mentioned in the post) just because it has the trigger handle and I think it’s actually 2 teaspoons worth. You can really make them what ever size you want depending on how much of the candy to want to eat at one time. These were delicious and I was pleased that they weren’t as sweet as I was expecting. I’m including them in Canadian-themed Christmas sweet boxes this year so thanks for sharing your recipe! I have made these two years in a row now at Christmas time and I LOVE the taste. However, my caramel doesn’t form as it should and I always have a flat mess. Looking at other recipes on Pinterest I have noticed that they did not add the butter (I used the Kraft caramels) and next time I make them I am going to omit that and see if I have better results. This is absolutely one of my favorite Christmas candies and I would not dare make them any other time of the year because I would eat every single last one of them myself. 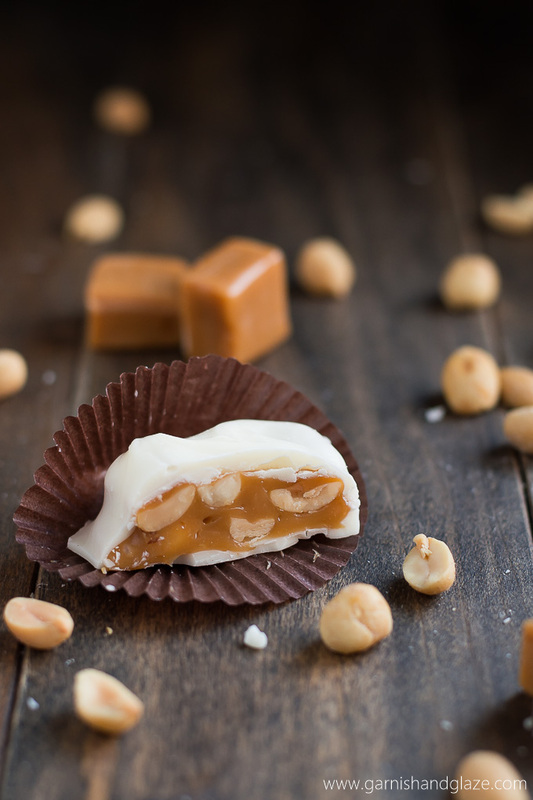 If you use the homemade caramel recipe, how long after removing from the stove do you add the peanuts and spoon onto parchment?